Every detail of this production bespeaks luxury. This runs the gamut from the highest quality resonant sound to the expensive reproductions of ancient Egyptian instruments to the encyclopedic yet accessible detail of the notes and vivid yet refined colour photography. There is no jewel case; instead we get the increasingly prevalent hard-card sleeve, CD mounting-stem and integral booklet. 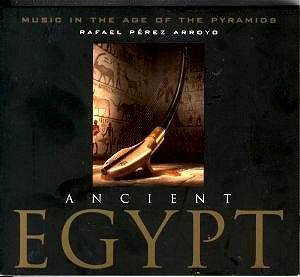 As to authenticity the booklet (in Spanish and English) points out that the results are based on more than ten years of research by Sr. Perez drawing on a range of artefacts (relics, papyri) from the pyramids as well as analysis of the folklore of the Nile valley, Coptic music and the iconography of Egypt. Ultimately of course such realisations can only be conjectural as you would expect from material dating back to circa 2500 B.C. Perhaps some scholars will do battle over such matters. The rest of us would do well to listen instead. The music here is always spare and often solemn in keeping with the Egyptian's Scriabin-like belief that music is part of a, greater continuum linking dance, the starry skies, death and cosmogony. There is nothing approaching a large ensemble or orchestral effect. Its character of the music is pentatonic, modal. The instruments used include voices, harp (stunningly recreated with sponsorship from Sony España by Sr Arroyo employing rare woods and other rich materials and built by Pedro Lopis), arghoul (pharaonic flute), double clarinet, tambourines and drums, sistra, wooden and other clappers, handclapping and voices. For most moderately well informed readers these tracks will variously call to mind music of medieval times (Machaut etc) and of the Crusaders. This is specially strong in the five hymn tracks (2, 4, 5, 7, 9). Melisma features strongly in the vocal contributions often punctuated with bass and tenor emphasised drums. From the twentieth century we may well be reminded of the music of Vaughan Williams (Flos Campi), Alan Hovhaness (in courtly Armenian, Korean and Japanese modes - try Ashet), and even Reich in the accelerating clapping in track 3. A tenor voice puts in an appearance for track 5 joined at the mid-point by some gloriously buzzing basses and shadowing woodwind. Pair Dance (track 6) is instrumental (winds, drums and clapping). The strangeness and sway and momentum of the Processional hymn is for me the most vivid track (9). I expected more harp contributions but in fact the instrument appears only sparingly. Its most commanding appearance is in the form of a minimalist harp duo in the final mesmeric track The Palace is Beautiful. Everything is rendered in richly directional sound which at the same time avoids gimmicky effects. These sounds, across thousands of years, are likely to find ready ears from the generation brought up on Riverdance, Nova Celtica, mysticism, Capercaillie, the Bagad, uillean pipes, Breton heritage and Alan Stivell. Others will find it an intriguing voyage of discovery even if the element of speculation must surely be strong.